Demonstrators at the 2017 March for Science in Los Angeles. Scientists and science fans alike will demonstrate in the second annual March for Science in 200-plus locations around the world tomorrow. The March for Science began last year mostly in response to scientists feeling that evidence-based thinking was in jeopardy following the electron of President Donald Trump. It’s a non-partisan group that hopes, probably first and foremost, that policymakers will think about evidence and science when making decisions. This year’s march is about not just marching, but taking action. The organizers hope that marchers will be able to meet and interact with scientists doing work in their own neighborhoods. Last year, thousands marched in hundreds of cities—we covered the demonstrations in London and Washington DC, where sign-wavers and chant-screamers discussed the importance of science in society. The March came with discussions about whether scientists should get more political, and was sometimes criticized for how it handled diversity and women’s issues. And in the year since, it seemed that the momentum had somewhat fizzled as the organization behind the March of Science was plagued with management issues, reported Earther. Things have been improving ahead of this year’s march, said Aaron Huertas, a science communicator and former national communications lead for the March, said in tweets and messages to Gizmodo. “I note with interest that they’re publishing board minutes, doing some financial disclosure and have adopted inclusion and equity, whistleblower, conflict of interest, and executive compensation policies. Good,” he tweeted. But there’s more to change than just marching. “Scientists have always been politically active, even when they don’t recognize it as such. Science has a grassroots movement that most of us recognize now,” he told Gizmodo. Huertas himself advocates for “science justice,” which includes sharing research results more equitably, preventing science institutions from oppressing others, and preventing the censorship of science. You may have also heard of 500 Women Scientists, which hopes to train “a more diverse group of future leaders in science and to use the language of science to bridge divides and enhance global diplomacy.” They and others offer resources speak out about issues in science and offer a long list of women scientists for those in need of expertise. And, as it turns out, scientists are not as engaged in politics as you might think. One recent study found that college students from science majors were among the least likely to vote, as discussed in The Conversation. That article mentions other studies that confirm scientists’ lower interest in politics as compared to those in other fields. Then there are political groups, including 314 Action, that are actively working to get scientists elected to public office. 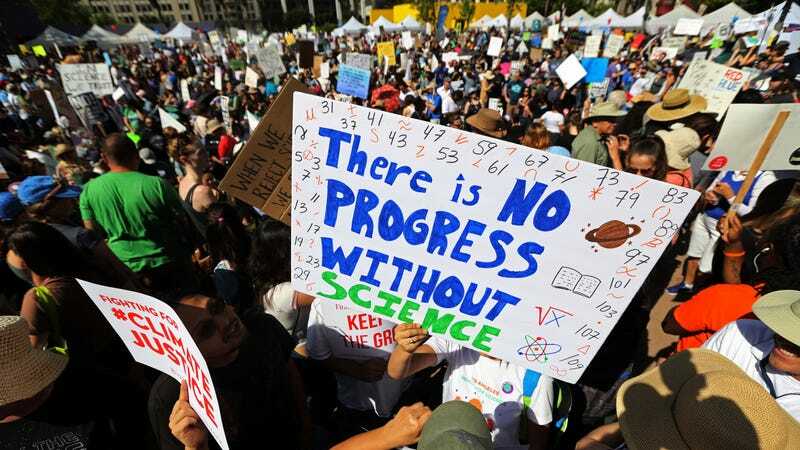 “We are thrilled that more than 7,000 scientists have reached out to us over the last year and a half for candidate training and support, and hundreds of them are running in districts across the country this year,” 314 Action spokesperson Ted Bordelon told Gizmodo. So, if you do march this year, you’ll probably meet like-minded science fans and local science-doers. But the march is also an opportunity to start working on more evidence-based policy at a grassroots level, so don’t neglect to stay involved after the protests are over. What the Hell Happened to the March for Science?